More than 600 residents have marched in opposition to plans to house 750 asylum seekers on a Dorset island. The Home Office is considering using the former Naval base HMS Osprey in Portland in Dorset to house refugees. The protesters marched along the causeway which links the island to Weymouth in a show of solidarity. Portland already has three prisons on it and residents fear crime will increase if the asylum centre goes ahead. 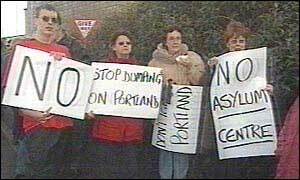 Portland deputy mayor Norma Bodtger said: "The people of Portland clearly do not want a centre for 750 asylum seekers." A police spokesman said the march consisting mainly of families had passed off peacefully with no arrests. Police are continuing to investigate a suspected arson attack at the site of the proposed asylum centre last Monday. The fire broke out after a public meeting was held by campaigners protesting against the plans.